If you need to add or replace a pump on your pool, the pump should be rated for your pool's size. 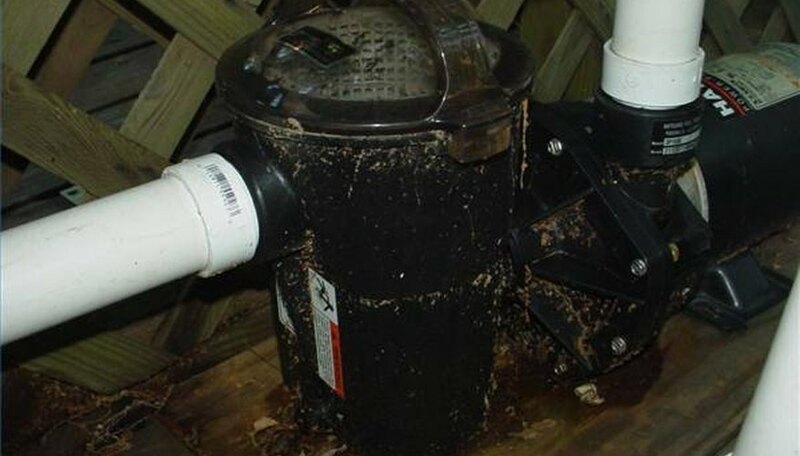 If installing on an existing pool, find a pump with the same fitting size and type as the one you are replacing. The pump installation is a straightforward project which can be accomplished in about an hour. Determine the location for your pump. Where you locate the pump will determine what plumbing supplies you will need. Most pumps will use a 1-1/4" pipe. In the most basic installation, you will need an adaptor from the skimmer unit to the 1-1/4" PVC pipe. You will then need a 90 degree fitting to screw into the pump. You will also need an adaptor to fit the outlet port on your pump which will connect to the 1-1/4" pipe. At the pool inlet you will need a second 90 degree fitting. You will also need two pieces of PVC pipe to fit between each of these fittings. If you are positioning the pump further away from the pool, you will need additional fittings and pipe. Install an inlet pipe. Your pool will have a skimmer device which includes a basket for preventing debris such as leaves from entering your pump and filter. Install a pipe from the base of the skimmer to the inlet side of the pump. On most units this pipe will feed directly into a second skimmer basket mounted on the pump. Install an outlet pipe. Run a second piece of pipe from the outlet side of the pump to your filter inlet. Carefully measure the pipe, accounting for the size of the fittings, and cut the pipe to fit. Be certain to clean all fittings and pipe before applying the PVC cement. Connect electrical power to the pump. Most pumps for household pools will be 120 volt and can be plugged directly into a standard receptacle. If the outlet is not protected from the weather install a protective cover over the outlet. Make certain the outlet is a GFCI (Ground Fault Circuit Interrupter)device. A GFCI device constantly monitors the circuit for any ground faults and offers an added degree of security. While it may not prevent all electrical shocks, it will generally prevent these injuries from being severe or fatal. Prime the pump. Block the water flow from the skimmer unit during the installation process. When the installation is complete, allow the water to flow into the pump from the skimmer. In most cases you will need to open the clear plastic cover on the pump skimmer to bleed off the trapped air. Once the air is out of the line the pump will begin to fill with water. Quickly replace the cover. Test the pump. Once all of the pipe fittings are set and the cement has had time to dry, the pump can be tested. Plug the pump into the outlet and it should begin to run. There will be additional trapped air in the system which the pump should expel into the pool. Within a few seconds the pump should be forcing water into the pool. If not, turn the pump off, check for blockage in the piping and make certain the pump is properly primed. Once any obstacles are removed, the pump should operate smoothly. If installing new PVC pipe use schedule 40. It is a heavier pipe and will be much more durable. It is highly recommended you install an on/off switch to control the pump rather than unplugging the unit. Try to avoid installing the pump below the level of the inlet water supply. This will prevent back-flow and the pump losing its prime each time it is shut down.